No counterprotesters or real firearms are in evidence. 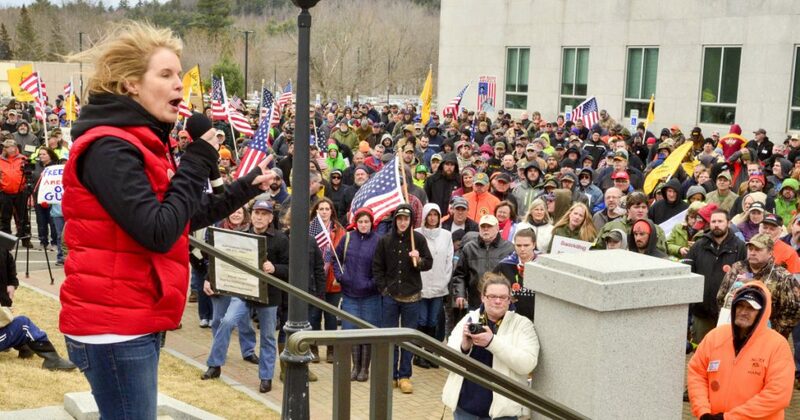 AUGUSTA — Hundreds of flag-holding, sign-carrying people rallied Saturday at the plaza between the State House and the Burton M. Cross State Office Building in support of maintaining their right to bear arms and warning politicians against interfering with that. The Second Amendment Rights Rally was peaceful but cold, and filled with cheers for those who took the microphone and said, “I support the Second Amendment” and the like. There were no counterprotesters in evidence. No real firearms were in evidence. However, silhouettes were printed on flags, on signs and even carried atop helmets. The rally site is a gun-free for all but police officers, as is all other state-owned and state-controlled property in Augusta. Police were on site as were a number of black-clad volunteers with “Security” written on their shirts and hats. On Saturday, rally organizer Bruce Ashmore noted the Augusta rally was geared to hear mostly from members of the public. “When you hear something from the people that’s from the heart, and it’s real, it’s awful powerful, isn’t it?” he asked attendees. The intermittent open microphone sessions showed the geographic breadth of attendees from Windham to Eustis and Bangor and beyond. Laura Parker of Sidney asked people to raise their hands if they lived in rural Maine – and she saw a lot of hands raised. 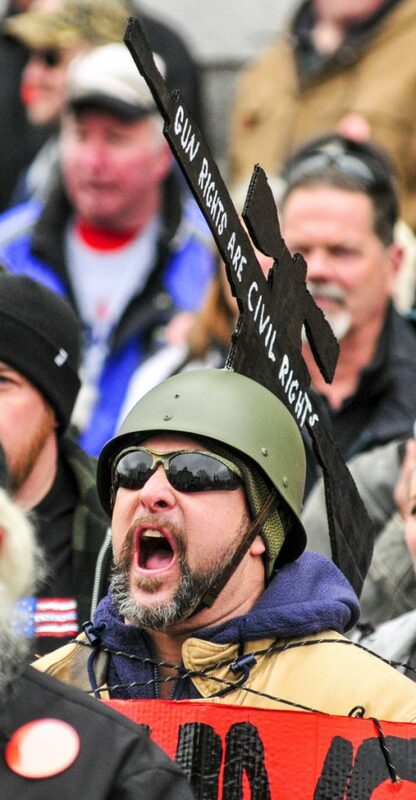 Joe Dobbins, of Hartford, wears a cut-out of an AR-10 tactical rifle during a 2nd amendment rights rally on Saturday in the plaza between Burton M. Cross State Office Building and Maine State House in Augusta. 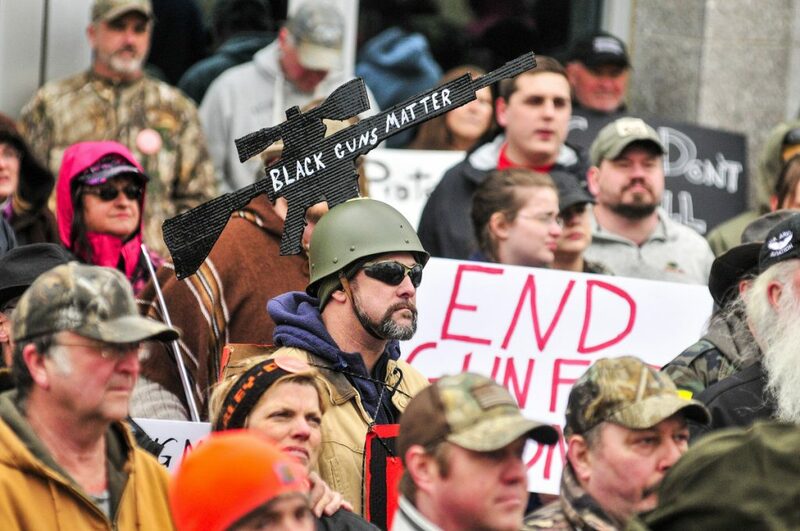 Joe Dobbins of Hartford wears a cut-out of an AR-10 tactical rifle during a 2nd amendment rights rally on Saturday in the plaza between Burton M. Cross State Office Building and Maine State House in Augusta. Gubernatorial candidate Sean Moody speaks during a 2nd amendment rights rally on Saturday in the plaza between Burton M. Cross State Office Building and Maine State House in Augusta. 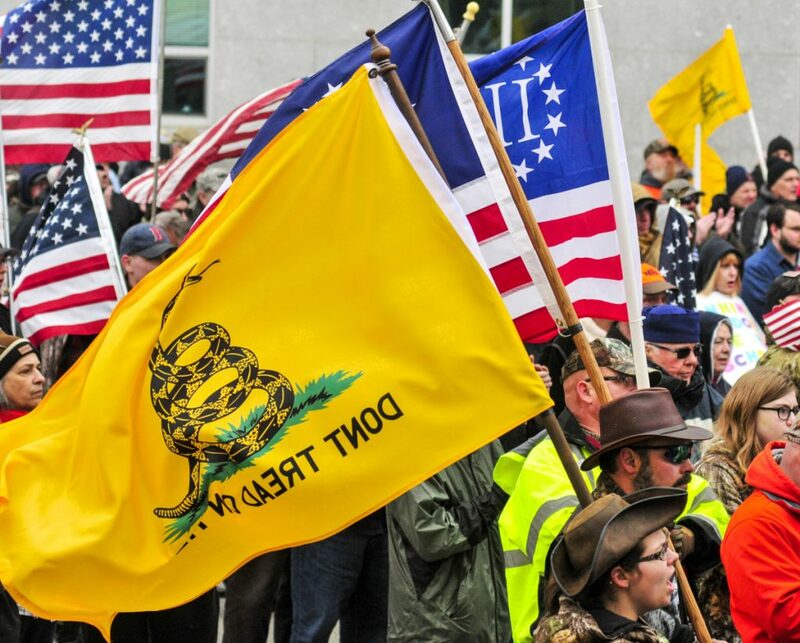 People hold flags as they listen to speakers during a 2nd amendment rights rally on Saturday in the plaza between Burton M. Cross State Office Building and Maine State House in Augusta. Franklin County Sheriff Scott Nichols speaks during a 2nd amendment rights rally on Saturday in the plaza between Burton M. Cross State Office Building and Maine State House in Augusta. U.S. Senate candidate Eric Brakey speaks during a 2nd amendment rights rally on Saturday in the plaza between Burton M. Cross State Office Building and Maine State House in Augusta. Gubernatorial candidate Garrett Mason speaks during a 2nd amendment rights rally on Saturday in the plaza between Burton M. Cross State Office Building and Maine State House in Augusta. Gubernatorial candidate Mary Mayhew speaks during a 2nd amendment rights rally on Saturday in the plaza between Burton M. Cross State Office Building and Maine State House in Augusta. 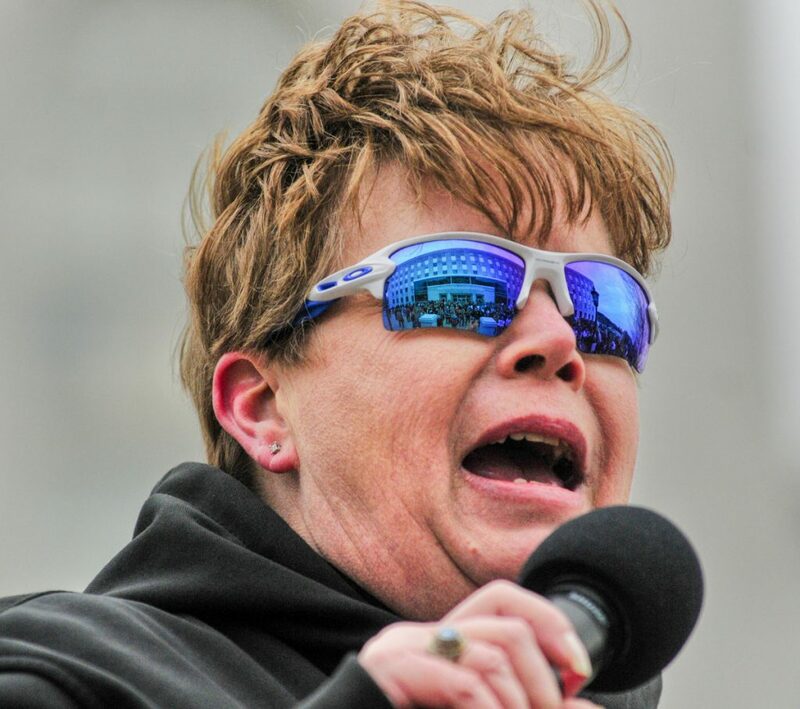 Tracilee Sullivan speaks during a 2nd amendment rights rally on Saturday in the plaza between Burton M. Cross State Office Building and Maine State House in Augusta. 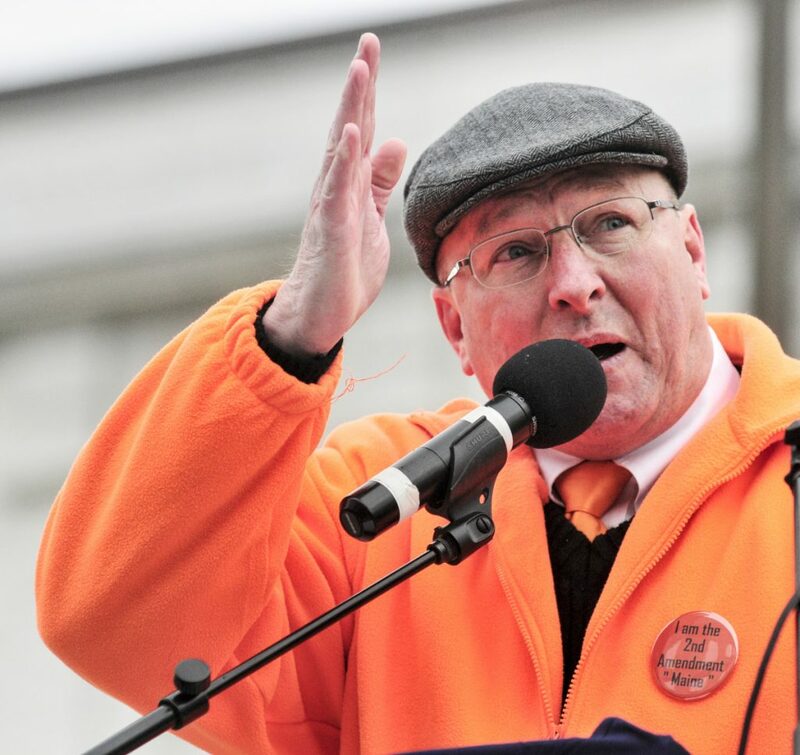 First district congressional candidate Mark Holbrook speaks during a 2nd amendment rights rally on Saturday in the plaza between Burton M. Cross State Office Building and Maine State House in Augusta. 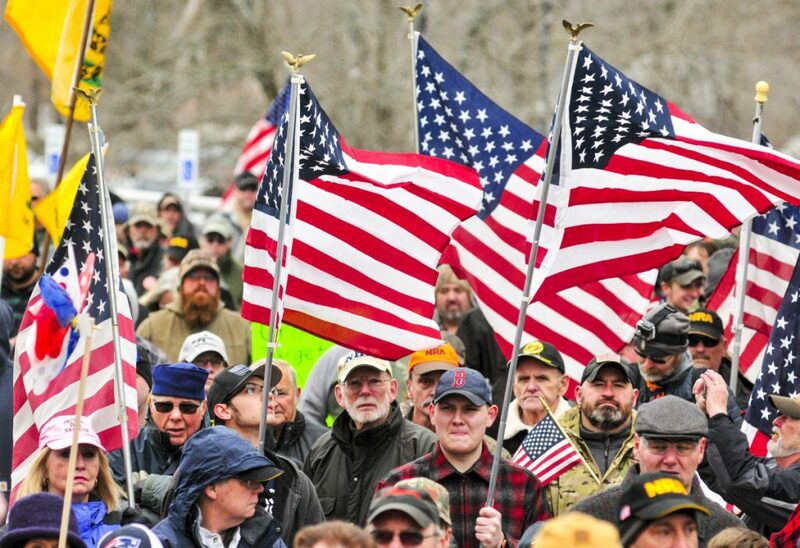 People hold flags and signs as they listen to speakers during a 2nd amendment rights rally on Saturday in the plaza between Burton M. Cross State Office Building and Maine State House in Augusta. Nancy White of Atkinson talked of being the aunt of Army Capt. Jay Brainard of Newport, who died on Memorial Day in 2012 when his helicopter crashed near Kabul, Afghanistan. “If he were here to day, he would tell us, What are we doing? This is America. We need to hold onto our rights. We need to stick to our guns, and we need to know that we can protect ourselves. Some of those in the crowd spoke briefly. One woman said she supported allowing teachers and staff in schools to volunteer “to be trained to protect and support our children.” Another woman said the government had to be removed from the schools. The rally comes amid heightened tension surrounding gun use. The nationwide rallies pushed back against a wave of student-led gun violence protests that some see as a threat to the Second Amendment, which guarantees the right to bear arms and has become a flashpoint in the debate over gun control measures in the wake of deadly school shootings. The rally also featured speeches from those running for public office and whose platforms include protecting gun rights. Republican gubernatorial hopeful Mary Mayhew told the crowd, “I’m running for governor because I’m going to defend all our rights, and I am certainly going to defend our right to own and bear arms.” She also said she “might have been a little controversial” as commissioner of the Department of Health & Human Services, and received death threats. Other Republican gubernatorial hopefuls speaking were Shawn Moody and state Sen. Garrett Mason. Mark Holbrook, a Republican challenging U.S. Rep. Chellie Pingree for her 1st District seat, also addressed the crowd. 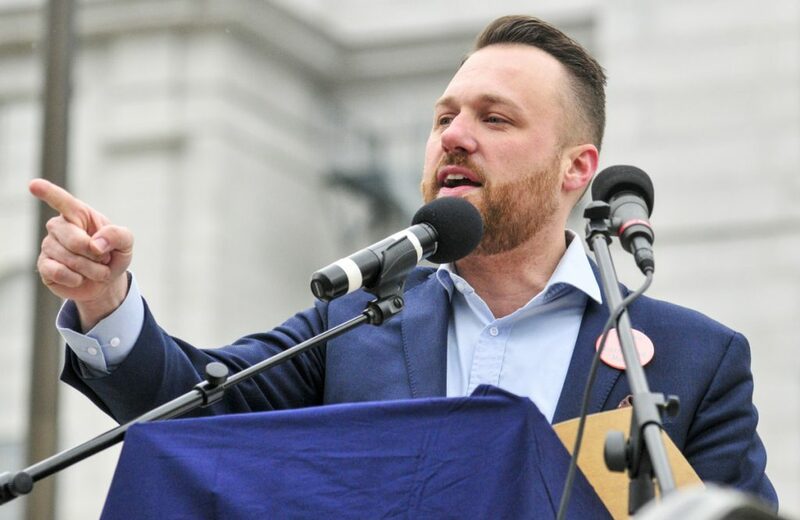 State Sen. Eric Brakey, who is challenging independent U.S. Sen. Angus King, reminded the crowd of the battle in the State House three years ago to pass the law allowing people to carry concealed handguns without a permit. Brakey was lead sponsor at the time, and a number of those in the crowd raised their hands and flags and signs, indicating they worked to help get that legislation passed. “That was something we did, all of us together,” Brakey said. Standing just outside the main crowd were Michael Comeau and Andrea Bosworth of Leeds. They brought their sons, Drako, 8, and Adrien, 7, and their dog Duke. Comeau said he wanted the boys to see political action in process. “I’m hoping the people get our message,” said another attendee, Jonathan Yellowbear of West Gardiner.